Red Robin Gourmet Burgers, Inc. is a casual dining restaurant chain with a menu featuring a variety of burger sandwiches made with beef, chicken, fish, turkey, pot roast, and vegetarian substitutes. Red Robin owns and operates 100 restaurants scattered across 13 states. The company also franchises its concept, maintaining licensing agreements with 98 additional restaurants located in 17 states and in Canada. With a per person average check of $10, Red Robin relies heavily on the sales of its gourmet burgers, which account for 44 percent of the company's food sales. 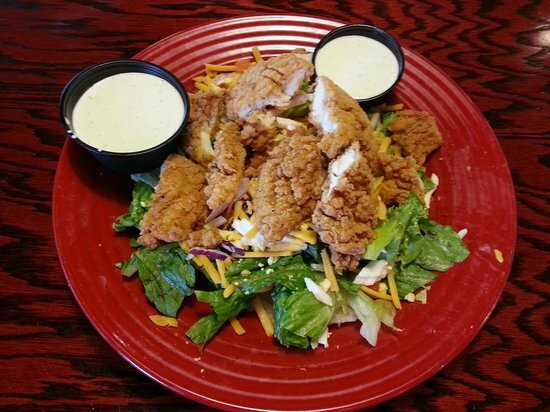 Aside from gourmet burgers, the Red Robin menu includes salads, soups, appetizers, and other entrees such as rice bowls and pasta. Cook chicken tenders according to directions and let cool; slice into thin strips. Place prepared salad greens on large plates. Sprinkle each salad with half of eggs, cheese and bacon. Put chicken strips atop all. Serve with dressing. Dressing recipe yields about 1 1/2 cups of dressing. Copycat Recipes for items on the menu at Red Robin Restaurants.